Bullet wounds received in the line of battle are treated as well as they can be in that situation, but the treatment is often primitive and ineffective. The bullet wound has to be packed with gauze to stop the bleeding, which often means shoving a lot of gauze deep into a living body – and then repeating the process. It’s unpleasant for everyone involved, to say the least, and many times it doesn’t stop the bleeding long enough to get the soldier to safety. A group of veterans, scientists, and engineers formed a start-up called RevMedX to come up with a better way to treat battlefield wounds. One of their inventions is called XStat: a customized syringe that injects small, specially coated pieces of sponge into a wound. 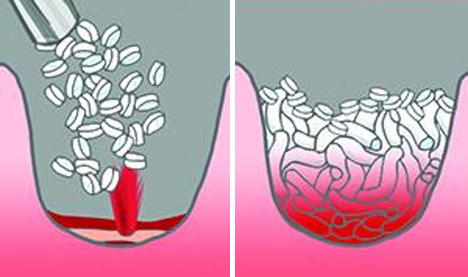 Unlike gauze, which absorbs blood rather than stopping its flow, the coated sponges plug up the wound by expanding and adhering to the sides of the wound. The 1 cm round sponges are made of a biocompatible wood pulp and coated with an anti-microbial, blood-clotting material.In as little as 15 seconds after the sponges are injected, the bleeding stops. The pocket-sized device, still seeking FDA approval at the time of publication, is so effective that the U.S. Army granted RevMedX $5 million to develop and refine the XStat. 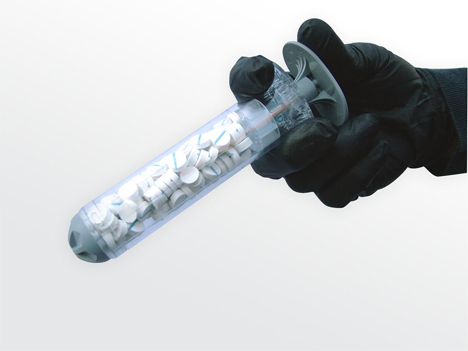 The team behind the project worked with a design firm to create the special syringe that would push the sponges into the wound quickly and efficiently. The sponges themselves are each marked with an X that can be seen on an X-ray, ensuring that after the wound has been properly treated, none of the sponges are accidentally left in the patient’s body. The truly brilliant invention could save lives not only on the battlefield, but in regular hospital situations as well. See more in Medical Marvels or under Science. February, 2014.